A sightseeing tour in Barcelona cannot be complete without visiting the masterpieces of famous Spanish architect Antoni Gaudi. Once you've ticked off the magnificent La Sagrada Familia from the list, head to Park Güell in Carmell Hill. A true testament of Gaudi's passion for everything nature, the park system is an enchanting place where the natural element seamlessly blends with the artificial. 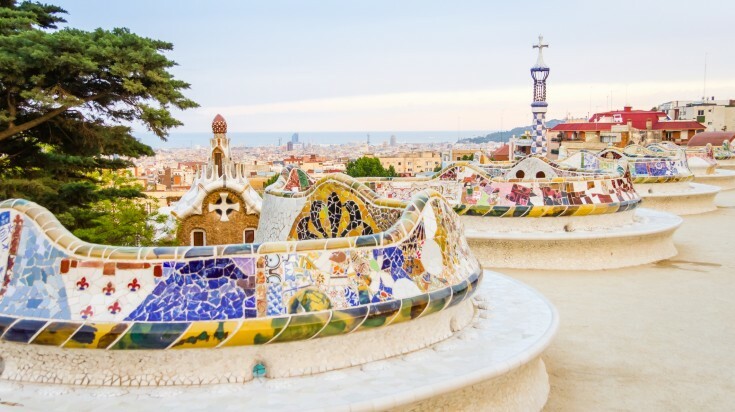 As you walk through the mosaic tiled stairs, flora and fauna inspired shapes and designs, columns and fountains, it isn't difficult to see how Gaudi's architectural brilliance took flight in this almost 2 hectares of space. 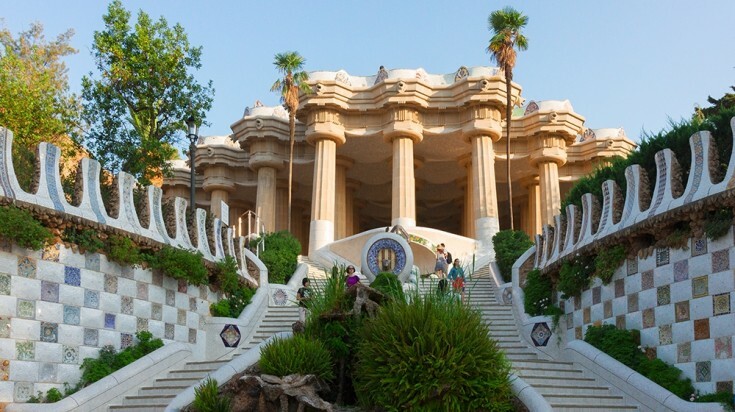 Open all year-round, Barcelona's awe-inspiring park is a definite not-miss. Entrance fee: Most of the park is free. Entry to Monumental Core costs USD 6 – 10, depending on age and special discounts. 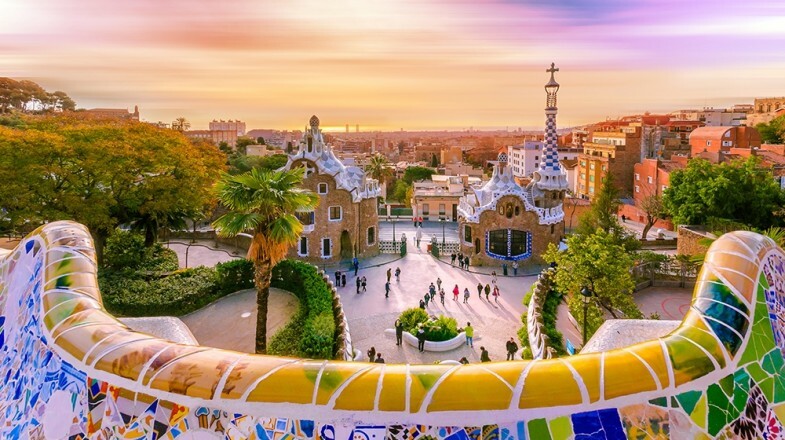 Named after the Spanish entrepreneur, Eusebio Güell, the businessman who commissioned Gaudi to build the park in 1900, Park Güell is today a UNESCO World Heritage Site. It was first built as a private estate for affluent families who would be buying and building their homes in it. Inspired by the residential parks of Britain, Gaudi named his park in English, Park Güell. Work came to a halt in 1914 when the estate failed to attract rich homeowners, but by then Gaudi had created what we see today. After Güell died in 1918, the City Council purchased the property and opened it in 1926 as a public park for the locals of Barcelona to see and enjoy the works of Gaudi. Today, the park receives at least 5 million visitors each year. Though it only covers 5% of the entire Park Güell, the Monumental Core serves as its highlight, featuring the open-air museum of Gaudi's work. In order to preserve and maintain the works, only 400 visitors are allowed in the Monumental Core every half hour, meaning there is plenty to explore within a limited time period. Perhaps the most popular attraction in the park, El Drac welcomes visitors to the Monumental Core as they ascend the Dragon Stairway. 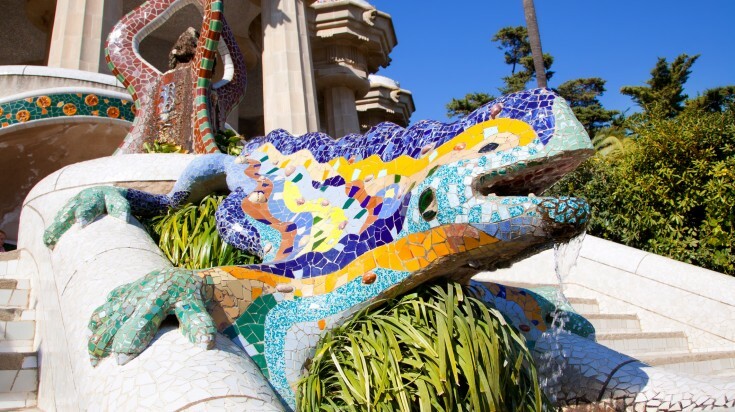 A salamander or lizard, El Drac (The Dragon) is covered in trencadis or mosaic from shards of tiles, a feature that can be seen throughout the park. Measuring 12 feet long, some say it is tribute to St. George who slayed a dragon for Barcelona. Called by many names such as the Greek Theater, the Terrace, and Central Plaça, this wide-open space offers an unobstructed view of Barcelona as well as other parts of the park. Another key feature of Plaça de la Natura (Nature Park) is the serpentine tiled bench, which impressively is ergonomically designed. The Plaça de la Natura is supported by 86 Doric columns, collectively known as the Hypostyle Hall, an imposing structure at the top of the Dragon Stairway. At its ceiling are more mosaic tiles made from chips of wine bottle and broken cups. Built within the park is no less than the residence of the great architect. In this 4-storey house, Gaudi lived for two decades before he moved to the premises of La Sagrada Familia Basilica. At present, only the ground and the first floor are open for public viewing where visitors can check out furniture and other Gaudi creations. An iconic structure in the park is the wave-shaped portico known as the Laundry Room Portico. 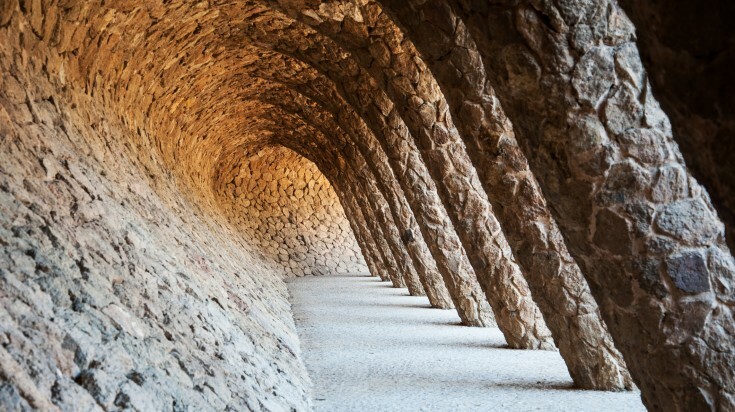 An inspiring pathway with slanting columns acting as double colonnade, this buttress is another Gaudi masterpiece. Two gatehouses at the main entrance to Park Güell, on Carrer d'Olot resemble the fairytale house from Hansel and Gretel. 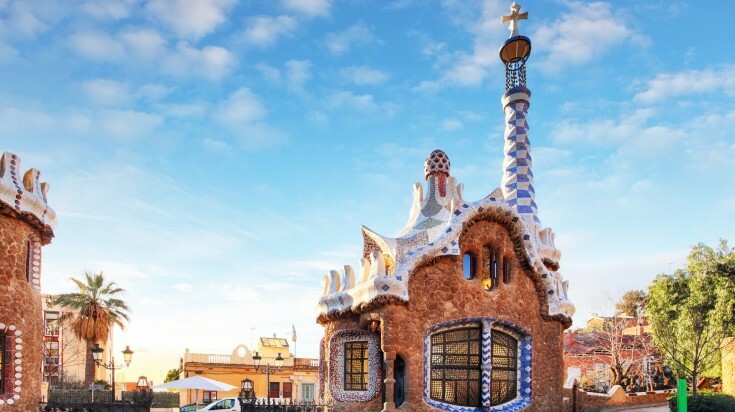 Its unusual shape and design mirrors the famous gingerbread house, and the roofs are made from Catalan clay and mosaic tiles. Park Güell is interconnected with three viaducts, that lead the way from Carrer d'Olot to the Three Cross Hill, the highest point of the park. The viaducts are the Pont de Baix, the Pont del Mig and the Pont de Dalt. They are built on columns and vaults made from stones found on the site. On the pathway itself are stone-crafted pillar with plots of vegetation at the top. Surrounded by green trees, plants and colorful flowers, walking on these pathways can be a romantic experience, especially when musicians are busking around. You can miss this part with its three crosses, thus its original name "Turo de Tres Creus". Because this is the highest point of the hill and the journey requires some stamina, tourists simply call this area, Calvary. The reward for the brave souls reaching the Calvary is a panoramic view of Barcelona. The park has three entrances — two at the base and another at the top of the park. The main entrance is Carrer de Larrard and not far from it is the Carretera del Carmen while Passatge de Sant Joseph de la Muntanya is the entrance at the top and can be accessed via an elevator. If you are taking Bus Line H6, D40, and 92, you will be entering the main entrance, Carrer de Larrard. Those taking the Metro will have the Passatge de Sant Joseph de la Muntanya as the nearest entrance. Take the green line and alight at Lesseps or Vallcarca and this entrance is within minutes away on foot. The park has two main areas, the free zone and the monumental core. Only the Monumental Core requires a ticket with Gaudi House Museum requiring a separate ticket. Tickets can be bought onsite from two ticket offices/ATMs in the park. Visitors can also purchase their tickets from Lesseps and Vallcarca metro stations. Children up to 6 years old enjoy free access. For those who want to save, online purchases let visitors save up to USD 1.17*. Tickets can be purchased online up to 3 months ahead with a maximum of 9 tickets per transaction. The ticket has a half an hour specific time band for you, and you have to be visit the park during the time. The ticket cannot be refunded or used for a different time. If you have free time before your time at the Monumental Core, you can explore the rest of the park. Hence, we recommend you book the tickets online so that you can pick the time of your choice. Plus, the prices are great online! Gaudi Park undergoes restorations anytime of the year. Make sure to check closures before your visit. Escape the crowd by arriving early in the morning or during off-peak. Enjoy great sunsets at Plaça de la Natura. An outdoor attraction, don't forget your protective gears depending on the season. Wear your most comfortable shoes unless you want to climb the hillside and stairs on heels. Most convenient way to reach the park is by bus and leave via metro. Avoid the line by purchasing your tickets online. You will need one and half hour for an entire tour of the park. Take food and drinks as there are no eateries in the park. Make the most out of the free access to monumental core before 8:00 in the morning. The park offers two guided tours - general and private. These tours run for 50 minutes in various languages namely English, French, Spanish, and Catalan, and take you through both Monumental Core and the free access zone. For just over USD 8*, you can join a general guided tour with 25 other visitors. This is great to spend a little extra in exchange for a more convenient sightseeing, without the fear of running in circles during your tour. However, you have to be in a big group and any questions to the guide might not be addressed. You also have to keep up with the group's pacing. For those who don't mind spending more, sign up for a private guided tour for USD 42* per person. Great for first time visitors and those who want a more VIP discovery at Park Guell, private guided tour only allows a maximum of 5 persons per group and you don't have to go in line as well as learning unknown areas within the park. You don't have to be an expert on Modernism or in Art to enjoy Gaudi's Park Güell. 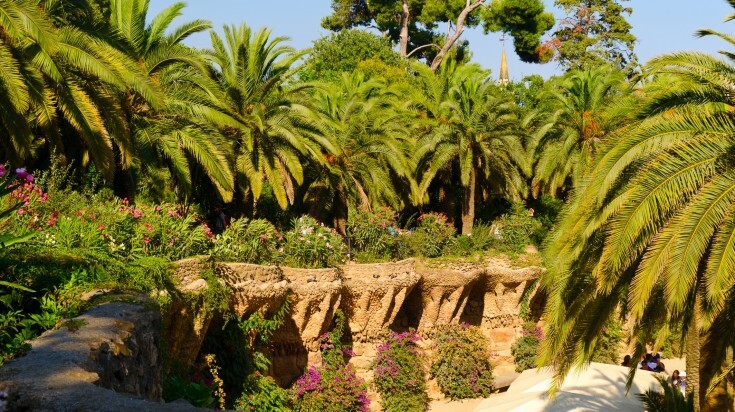 From its iconic attractions to the smallest detail, Barcelona's famous park is a feast to the senses. It can cost a little from your travel budget and a little bit outside the city center, but rest assured this is no tourist trap. 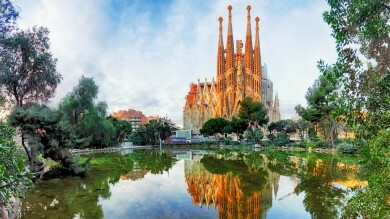 If you love art, history or both, this is unquestionably a place to visit when in Barcelona. *Note: Prices are as of July 2018.